Please be clear: Lead Forensics will do anything in their power to get a customer. Each customer is locked in for at least a 12 month contract, which they can’t get out of. When a business is trialling Lead Forensics and their competitors, the trialler is trying to decide who to go with. 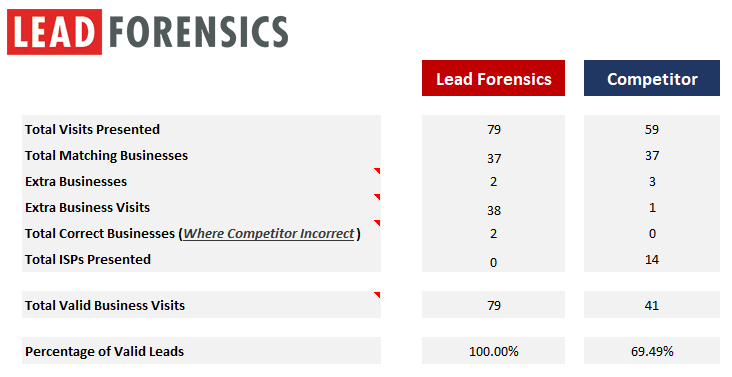 Lead Forensics encourage those triallers to send them data collected from competitors. The trialler (wrongly) trusts Lead Forensics to present a fair view. What should happen is that the trialler does their own analysis so that they get a totally impartial view of how one product compares against another. Anything else is going to get a biased view. Here we’re going to focus on how Lead Forensics present a view of the data that makes them look very favourable. It looks impressive at first glance but upon closer analysis, the deception becomes clear. It’s worth noting that it’s not just A1WebStats that Lead Forensics do this to – we’ve seen evidence that they do it to their other competitors. The loser out of all this is the company that trials software, who ends up locked into a contract thinking they’re getting a much better solution, when the reality is that they’ve been deceived. We’ve seen several of these now and feel it’s time to provide an example of where the flaws are if you trust Lead Forensics to present an accurate view. 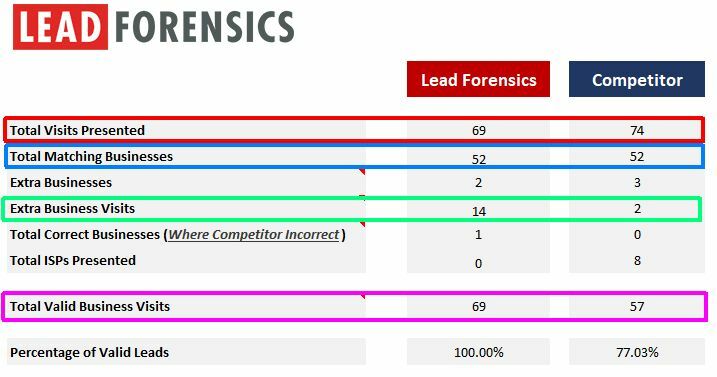 The image below shows the Lead Forensics comparison to A1WebStats, as presented by them to a mutual trial subscriber. Necessarily, we keep the identity of the trial subscriber anonymous. 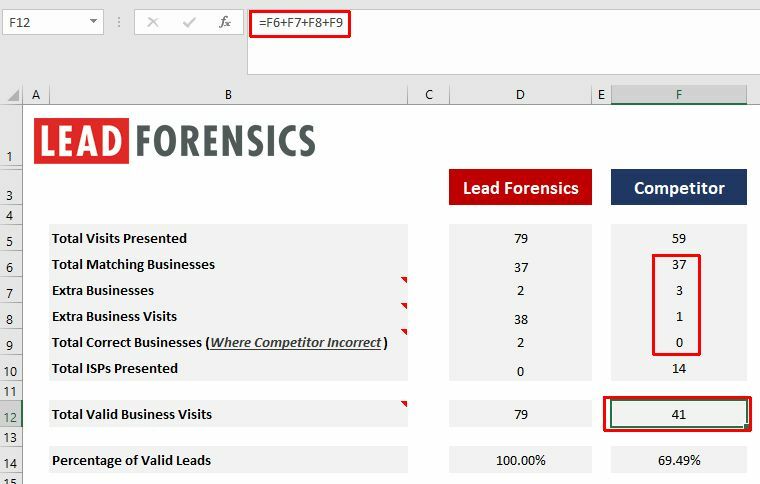 You may be wondering why we would present data that on the surface apparently shows that Lead Forensics have 100% of businesses showing. A1WebStats are always totally honest about our product, even when that may not work in our favour. 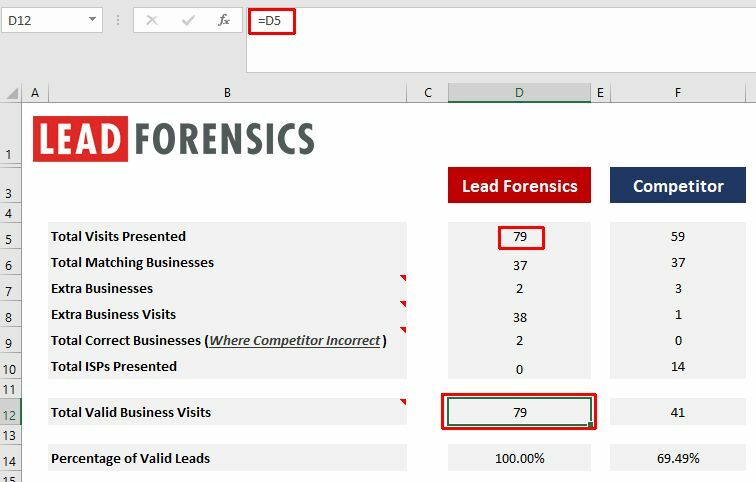 The data above implies that Lead Forensics identified a total of 79 visits during the analysis period, and A1WebStats had only 59. See that big block of yellow? That was the time when A1WebStats wasn’t even installed on the triallers website! 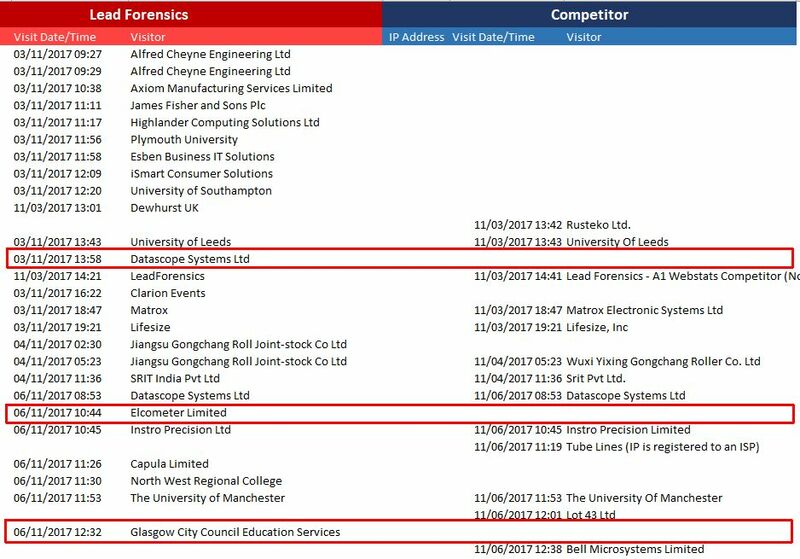 So Lead Forensics have counted those 10 extra companies as part of their 79 total visits. That’s very clearly deception. So we can take 10 off their analysis data. Also, when we looked at the data in detail, we actually had 74 total visits recorded during that analysis period, instead of the 59 portrayed by Lead Forensics. Take a look at the red highlighted areas below. They show that the ‘Total Valid Business Visits’ are a calculation of four fields added together (for the competitor, which is A1WebStats in this case). That is clearly there to say “if the cells D6 to D9 are not equal to ‘Total Visits Presented’ then insert a message of ‘ERROR IN DATA’ (which provides the opportunity to then manipulate the data further). 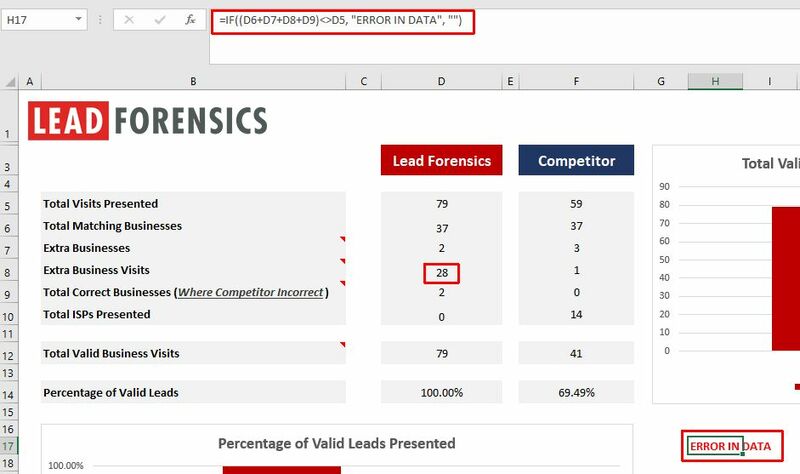 This is a serious question the trialler has to ask: why do Lead Forensics not use the spreadsheet calculations the same for themselves as for the competitor? Don’t think too hard on that – the answer is “because they always want to be seen to be 100%”. The screenshot below shows (highlighted in red) a few examples of data that Lead Forensics said that we didn’t have. Now look at the truth – the screenshots below show the actual visits of those three examples within the A1WebStats data for that trialler. What we’ve done is taken all the comparison data and have colour coded it. Yellow – we had the data when Lead Forensics claimed we didn’t (or our tracking code wasn’t installed at the time). Grey – an area of dispute (covered within Deception 4 further down). Red – an area where we got it wrong. When we went through all the data we saw substantial differences between the Lead Forensics view and what the truth was. In the image above you’ll see areas marked in grey. These represent disputable data. Sometimes it’s a difference in opinion of what the IP data actually means and sometimes it’s Lead Forensics being deceptive. Lead Forensics claimed we had it down as an ISP. That’s odd, because when we looked at the data for that date/time, there was no mention of Tube Lines at all, so we have no idea why that’s been put in there. Lead Forensics had it down that we didn’t have a visit at all on that date and time. We did, but the name wasn’t quite the same. 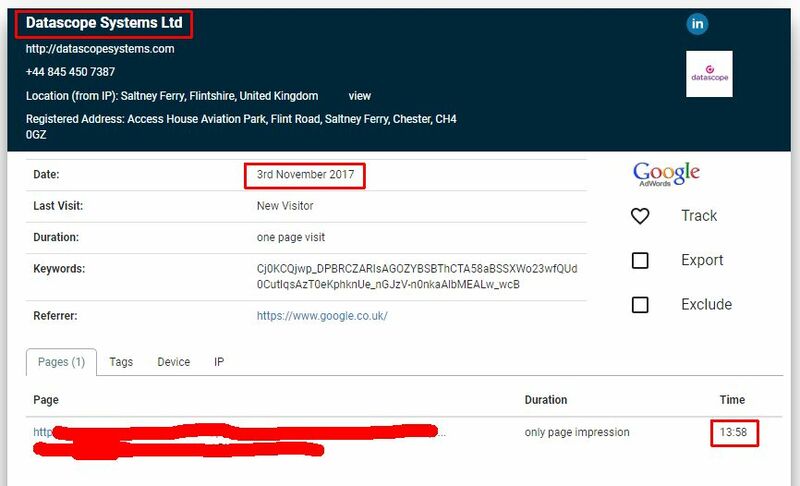 So, slap on the wrist for us, but it was dishonest that Lead Forensics portrayed us as having no visitor at that time – it was purely a slightly different name. The nature of linking IP addresses to companies is complex, plus there are also other methods that can be used to identify visiting companies. 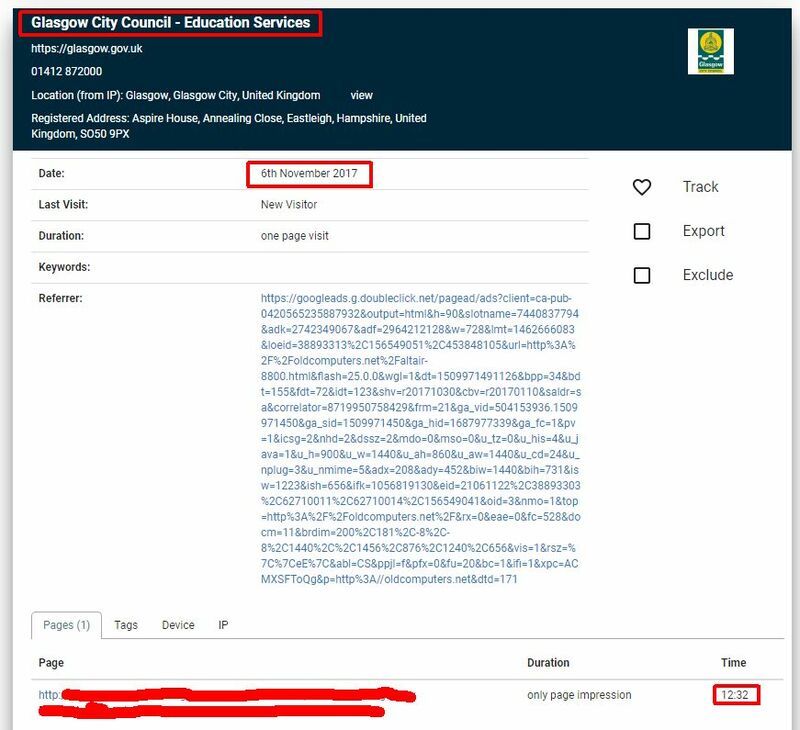 In the example on this page, there were certainly companies that Lead Forensics identified, that we didn’t have in our database. There were also some that our system listed incorrectly (ISPs). But the differences (considering you pay a LOT more for Lead Forensics) are not as portrayed by the biased analysis Lead Forensics have undertaken. The parts marked in red show that there was quite a difference in the total visits that should have been counted in the data. 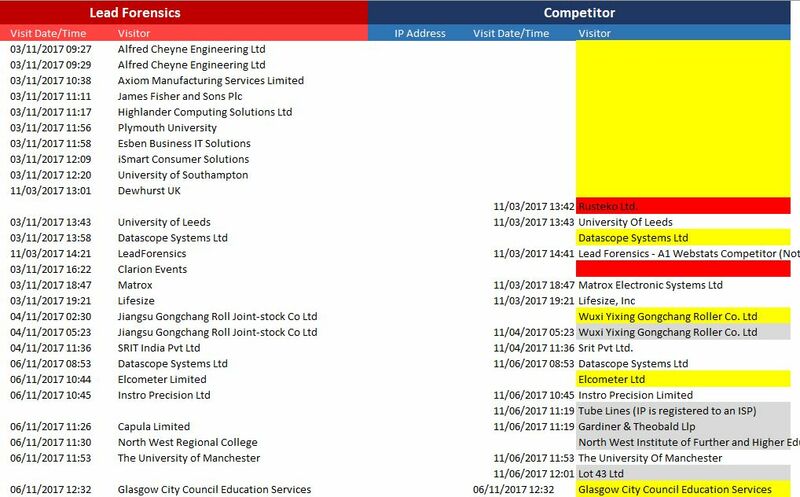 The parts marked in blue show that the matching businesses were a lot higher than originally portrayed (52 after analysis vs the Lead Forensics view of 37). The parts marked in green show the biggest differences. 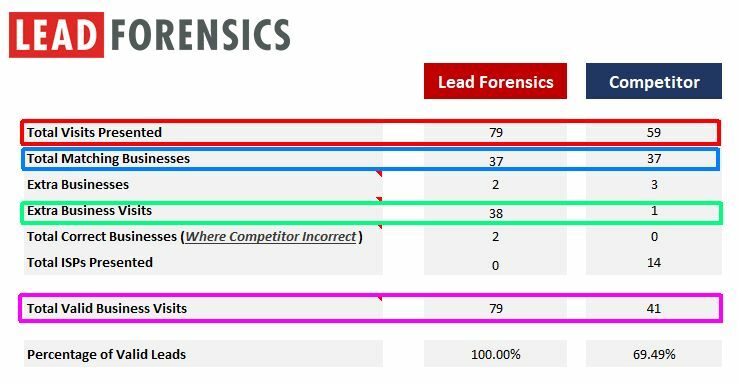 Whereas Lead Forensics claimed they had 38 extra businesses and we had 1, the updated data showed a difference of only 12. Finally, the parts marked in pink show that that actual difference was 12 in Lead Forensics favour and not a difference of 38 as they portrayed in their analysis. You may be thinking: “what sort of business shows data that, while highlighting that their competitor will use deception for their gain, still shows A1WebStats as having less data?”. Our customers would happily support that we are always honest. If we mess up, we admit it. If we aren’t strong in an area, we work on it. The example above shows a maximum potential of 69 businesses that went to the triallers website during that time period. When a business works out the potential of useful companies seen visiting their website, then the value of the ‘businesses’ data shrinks. There was a difference of 12 between systems. Chances are that many of those 12 fell into the categories above, which makes the difference less relevant. 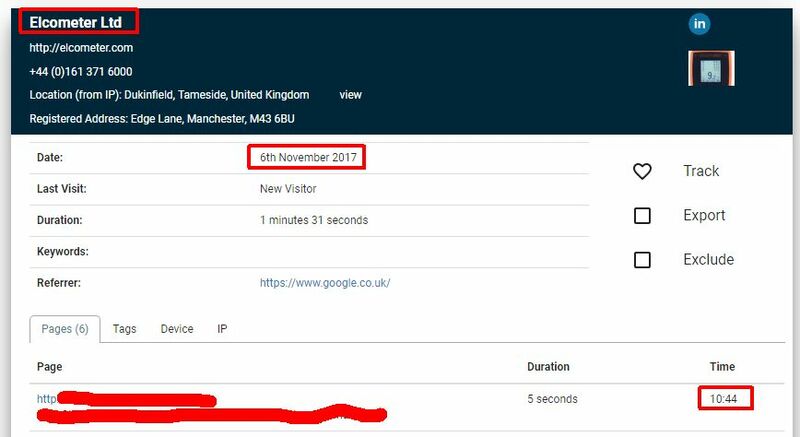 Having said that, if you trialled Lead Forensics, us, and anyone else, you would hopefully be looking closely at the companies that visited your website. Let’s say you identified that one supplier had data that was ‘gold’ to you – in that case the difference would be important. But we suspect that when you actually fully utilise the data from trials, you won’t find enough difference to make it worth spending the substantially extra cost of Lead Forensics, and being locked into a long contract. What about the unidentifiable visitors? We spent some time looking at the data for that trialler and focused on the product pages within their website. We found that only 28% of visitors to those product pages were identifiable as companies. The nature of their product is that it wouldn’t attract casual traffic to those pages, so what about the other 72% of visitors who couldn’t be identified by company name? Lead Forensics won’t highlight that statistic because it shouts out “it is not possible to identify all companies who visit a website” and that flies in the face of their misleading advertising, as detailed on our page https://www.a1webstats.com/what-it-does/visiting-companies/truth-companies-identification/. From outside the main place of work (which makes them unidentifiable). For example, at home, or from a mobile device. From a work location that isn’t identifiable by its IP address. So, although it can be useful following up with identifiable companies that visit a website, we’d suggest that it’s more useful to build an understanding of why visitors to certain parts of the website don’t then go on to make contact. This is explored in much more detail, including a test you can do yourself, on our page https://www.a1webstats.com/what-it-does/visiting-companies/stop-chasing-companies-start-gaining-enquiries/. The purpose of this page is to demonstrate that it’s madness to expect a potential supplier to give you an unbiased view of how they rank against their competitors. We hope that, by being open about us not being perfect, we are at the same time showing that Lead Forensics will do anything to get your business. There is only one definitive way to gain more business from your website, and that’s to make the website good enough for people to want to make contact with you. It doesn’t really matter whether it’s Lead Forensics or us, or anyone else, that’s showing you companies that go to your website – the very fact that you’re having to go through the pain of chasing those companies means that you are being let down by your website. You know this because you have been to various websites that haven’t impressed you, and you haven’t made contact with those businesses. The same applies to those people going to your business website. Many years ago, before companies identification was possible, the clever businesses focused on analysing their website visitor patterns, so that they could strengthen the potential of visitors to make contact with them. You are chasing companies who visit your website. Your competitor is chasing companies (probably the same ones) who visit their website. The only sensible way that you can avoid having to adopt number 1 above is if you make your website strong enough so that those companies take the decision to contact you, therefore removing your competitor from the equation. Clever companies analyse and strengthen their websites, resulting in more enquiries being gained. Lazy companies chase identifiable companies and do nothing/very little to strengthen their online proposition, resulting in losing ground to competitors. We see evidence of this all the time – businesses within the same sector as each other, where one is clearly struggling and the other is thriving. Same sector, same target audience. Different mindset about what matters. One thrives, the other declines. We want our customers to be winners, which is why the A1WebStats system offers so much more functionality than identifying visiting companies. Think we’re wrong? Please do challenge us – set up a free trial with us and let us show you how you can get more companies contacting you, instead of you having to chase them.